The fall fishing season on Norfork Lake is starting to take off. 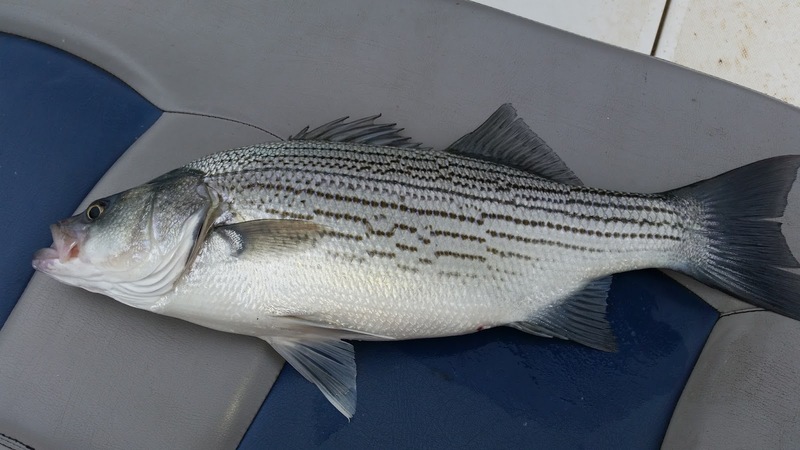 The stripers, hybrids and white bass are schooling and following the bait fish. I have fished the last 7 days with success each day, but as usual some days are better than others. I have been fishing anywhere from my cove then going east of Cranfield and also north of Cranfield. All my fishing areas have been within .1 to 8 miles from our resort. This isn't to say fish are not in other areas of the lake, I am sure they are, but I can only cover so much water in a day. The continual weather pattern changes effect the fish and the locations where you will find them. On windy days go into the wind blown creeks and coves especially if the wind has been blowing into the area for several days. Wind blown banks are also a great place to check. 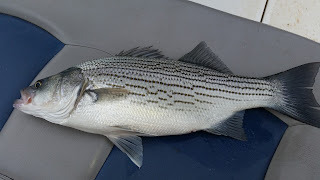 I have had good success for stripers, hybrids and white bass. One of the biggest changes that I have noticed is that the better bite for me has been mid day. I typically sunrise and sunset times, but for whatever reason it is different right now. I am sure the feeding time will change soon so I guess you all will need to fish from sunrise to sunset. :-) Earlier in the week I was finding them halfway back in creeks and coves in 30 - 40 feet of water. As the week progressed I noticed the bait fish were moving out to the mouth of the creeks and coves and also into deeper water. Yesterday I found a lot of bait on the bottom in 40 - 50 feet of water and the fish were in the area. The biggest challenge that I have had is that when I find a big school of feeding fish and hook up immediately, but by the time I get the fish in the boat the school has disappeared. I continually move around in the same area slowly until I find the next school of fish. They may be close to the bank or out in the middle. Over the last week I have only been vertical jigging with a 3/4 ounce spoon. Color really doesn't matter much when you get into a school of fish, but I typically use a spoon with the predominant color being white. As the lake water cools the bait will start to migrate out to the main lake and the fish will follow. It will not be long before fishing the big flats will become the main areas where I will concentrate my fishing habit. Bass fishing has also been good. My main area of success has been part way back into creeks and coves, vertical jigging a spoon in 25 - 35 feet of water. Here again I move slowly jigging as I move trying to keep the spoon as vertical to the bottom as possible. Casting out a jig & pig or really any plastic bait on the bottom in the 15 - 35 feet water range will bring up some nice fish. Two days ago I landed a nice 20 inch largemouth that I released immediately. Walleye will also be in the same area. Yesterday I landed 3 walleye, but all were 1/4 - 1 inch short of the 18 inch minimum length limit. Not a lot of news on crappie fishing. I pick up a few strays while striper fishing. I did catch a nice 15 3/4 inch crappie in 50 feet of water the other day. I have heard you can find them on 20 - 35 feet deep brush, but here again one day they are there, but the next day gone. As the water cools they will start to associate more to the brush piles than they currently are. Bluegill fishing is still very good with crickets being the bait of choice. 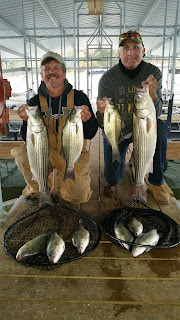 Find brush in 20 - 30 feet of water and drop the bait down from 15feet to the bottom and you will catch some nice big slabs. 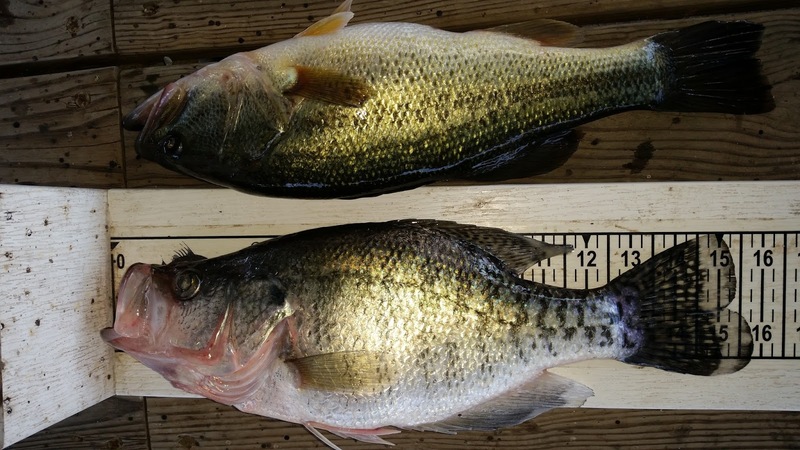 Catfish are biting good on trot lines and jugs using live bluegills as bait. Coves and creeks are a great place to set up. I have also picked up the occasional catfish while vertical jigging with a spoon. They do give a great fight. Norfork Lake level has finally stabilized at 553.72 which is basically normal pool. Very minimal power generation has occurred over the last several days. This will be a great thing for fishing as the continual draw down of the lake has effected the bite. The lake surface water temperature is 66 - 68 degrees depending on the location on the lake. The main lake is clear with the creeks and coves stained. The clearing of lake will start to happen as the water cools.